There are two solar eclipse going to occur on 13th July 2018 and 11th August 2018 respectively. Even though these eclipses will not be visible in India but still there will be astrological effects on all zodiac signs due to transitional and conjunction impact of planets. Solar eclipses are very powerful and are known to be indication of significant and powerful endings and beginnings. 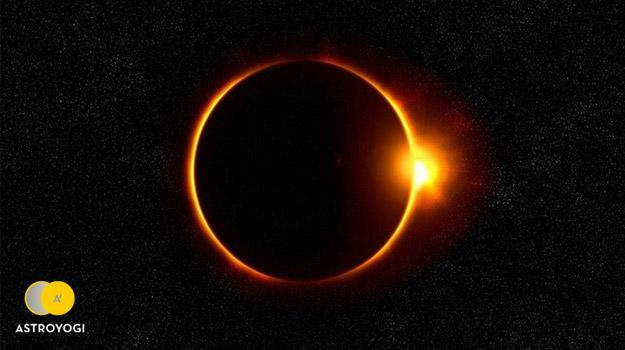 Events triggered by solar eclipses usually have impact for around six months so be prepared. Most people will begin to see major changes in life as they will be finding special opportunities apparently to break old patterns that no longer serves them. Eclipse occurred on 13th has major impact on Gemini, Sagittarius, Cancer and Capricorn risings and moon sign natives. CONSULT EXPERT ASTROLOGER RUCHEE MITTAL ON ASTROYOGI FOR PERSONALISED HOROSCOPE ANALYSIS AND GUIDANCE. CLICK HERE TO CONSULT NOW! All Cancer/ Capricorn rising and Cancer/Capricorn sign natives will be most effected by the solar eclipse occurring on 11th August 2018. These people may find them redoing their lives from toes to the top of their heads. There will be a radical change in their appearance as they will enhance their image to reflect the massive changes going in and around them. Mostly things will depend on the part of your chart which is activated during this period. Eclipse falling in 1/7 will be affecting self/marriage or love relations, 3/9 travel and religious pursuits, 5/11 education and earnings and so on. Remember change is always good. Change in thought, manner, speech, dress, lifestyle, career, health, family expectations and goals are all part of the process of creating a more fulfilled life. You might feel uncomfortable as you let go off usual and step out of your comfort zone but you need to make room in your head and heart for new ideas and a new life ahead. Any confusion or sadness you are experiencing now is helping you process some deep-rooted emotions that were never fully processed. As you go through whatever you are experiencing now, be it joyful or soulful, ask yourself how this is similar to what you felt as a child, and recognize this as a gift from the Universe to move onto the next chapter of your life free from whatever it was that held you back because of these feelings. Remember your secret desires will not be secret any more, what is hidden will come to light. There will be uneasiness among family members and they will be quite unpredictable. Parents may be testing their marriage. You may experience life changing events. Their might be the need of some kind of repairs at home. Keep a check on expenditures. Do check all communication equipment like phone etc. as there might be a need of repair or change. Expect a lot of family drama as any sibling or parents may choose make a life changing decision. There are good chances of any restrained complaints coming up again, deal with them with a calm mind. Be positive towards those you love. You will be getting good job prospects as change in job is likely to happen with the change in work conditions. Be careful while driving. Be prepared for some unplanned expenses if your financial strategy has not been realistic lately. Lots of changes are coming up. Be prepared as there might be lot of things getting shake up in general and your life might become quite interesting. Try to be calm and positive towards everything as they come up. These are the events or things that were needed for you. This is the time for you to change and redefine yourself and your overall personality. There will be chances to explore unknown territories in your career. There will be more people judging you and trying to change you. It would be better if you can do a personal self-analysis and redefine your self-image and self-concept and also how you project yourself to others because others doing this will not be pleasant for you. You will be more inclined towards spirituality. Whatever you have learned till now or are practicing will be reviewed by you only for the best. This will be testing time for those around you but good relations will survive. Universe only wants best for you and anything that falls short of that will go away. There will be some kind of opposition and misunderstandings in work field specially for those who are in job, which may make you decide for a change. You may need to change your desktop or laptop or a repair might be needed. Be prepared to make adjustments at financial part. There can be lot of drama in lives of friends and near n dear ones. Be prepared for success as there will be lots of new opportunities coming your way as far as your career is concerned. All the obstacles will be falling apart. But remember even positive changes are not easy to take in as all this new arrangement doesn’t come without drama happening around you. You will be feeling blessed as if success is just falling in your lap. You will be spending a lot of quiet time at comfort of home as there will be many psychological realisations happening in your life. There can be some issued related to tax or insurance which might result in some financial changes. You might reconsider your religious beliefs. The universe will be getting you on track to make you put your best foot forward. Get a clear and determined focus on your goal of life as this will be a testing period for you. All committed relationships will get tested whether personal or work related. Connections that are for your higher good will get stronger and those causing obstructions in your growth will fade away. Be positive and be objective. All the obstacles in your growth in almost every area of your life will come to an end. There might be some disturbances at work which may result in change either in same place or new one. Be patient with loved ones as things might fall out of place. You will be focusing on your career right now so that you can get into most satisfying state regarding this. But be assured as this eclipse is kind of gentle towards you. take out time to take proper rest to ensure a good health. There might be job change later if you desire so. CONSULT EXPERT ASTROLOGER RUCHEE MITTAL ON ASTROYOGI ASTROLOGER APP FOR PERSONALISED HOROSCOPE ANALYSIS AND GUIDANCE. CLICK HERE TO DOWNLOAD THE APP NOW!